"Founded in 1979 with a store in Lismore New South Wales, Fundies Wholefood Market formerly (Fundamental Food Stores) is now one of Australia's leading retailers of natural & organic foods, with 5 stores situated in the Northern Rivers area and Brisbane. At Fundies we are totally mission driven. We are very selective about what we sell, with strict quality control and commitment to sustainable agriculture." 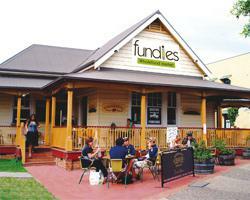 Fundies has a helpful and friendly staff, and a wide selection of eco-products. They have an in-store naturopath that gives good advice. Next door they have a cafe where they sell delicious juices, and awesome salads and other food! It's right in front of the visitor's centre which makes it very convenient for travelers who are just off the bus or waiting to be picked up. They occasionally have notice boards up in front of the shop where the locals are able to sign petitions... for example I signed one against having a KFC put in town.